Author: Elaine Avidon, et al. Summary: This e-book includes powerful chapters written by teacher-consultants about the individual and collective impact of their work and its alignment to their site’s mission and beliefs about professional learning. Reading select chapters would support fellows in imagining different kinds of school coaching; alternatively, the book offers a powerful model for site leaders who want to pull together leaders to collectively evaluate and write about the impact of their site’s programs. The intent of this effort was to articulate for ourselves and others what we knew experientially—the value and potential of professional development in writing and reading across the curriculum that (1) is situated in long-term relationships with teachers formed around their work and (2) views the agency of each teacher as a key component of these professional relationships. 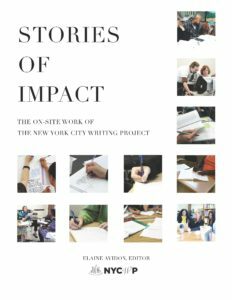 Stories of Impact, begun in earnest in 2007, is one result of that effort. The chapters that follow, grounded in the day-to-day realities of professional development in urban public schools, make visible the small but skillful acts of “good workmanship” (Berry, 1981, pp. 275-281) that comprise the craft of working alongside one’s colleagues over a sustained period of time. Each narrative demonstrates the importance and complexity of being responsive to the particulars of context, place, and person; of allowing teacher and TC time for the slow altering of ideas this work often demands, and of the negotiation not just of ideas but of standards, which this work is so often about. The writers also portray what they must grapple with and rethink as Writing Project TCs given the data-driven accountability that determines much of what goes on in our city’s schools and classrooms.